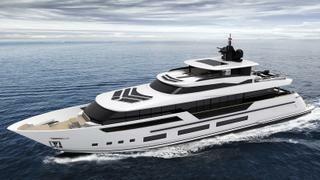 Chinese yard Heysea Yachts has confirmed that it has taken an order for a 38.4 metre Asteria 126 yacht. The Chinese client also bought an Asteria 96 and a Heysea 82 yacht from the yard’s range, Heysea adds. Due to launch in January 2019 with delivery later that year, this in-house design will be built from an FRP hull and superstructure with a beam of 7.68 metres, a maximum draught of 1.54 metres and a total interior volume of 270GT. Accommodation is for up to eight guests split between four cabins, including a main deck owner’s suite. On the lower deck, a full-beam VIP sits just aft of the portside twin and starboard double cabin. The crew quarters are situated in the bow and allow for a staff of up to five people, with a crew mess and double cabin for the captain. Key features include a Cabana-style beach club complete with dayhead, and a large aft deck, which is split between sunbathing space aft and sheltered dining space further forward. Moving inside and the open-plan saloon comprises an eight-person dining table, L-shaped settee and a bar area with three stools. However, the star of the show is the spacious superyacht sundeck — this area will be fitted with a tender davit, spa pool, dining table, barbecue, bar area and a C-shaped settee, with enough room leftover for three sunloungers to be placed back aft. Power will come from a pair of 1,925hp Caterpillar C32 ACERT engines for a top speed of 22 knots and comfortable cruising at 19 knots. When trimmed back to an economic speed of ten knots, the Heysea Asteria 126 will have a cruising range of 1,200 nautical miles, drawing on a total fuel capacity of 13,500 litres.